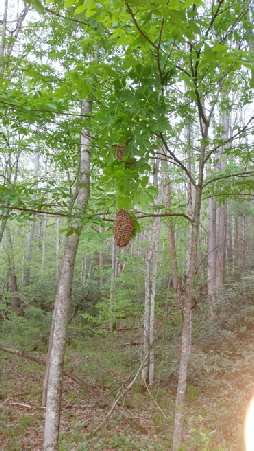 We would like to welcome all beekeepers to visit the Haywood County Beekeepers Chapter (HCBC) of the North Carolina State Beekeepers Association and it is our hope that the information contained in this website will enlighten and inspire about honeybees. Our goal is to offer information and encouragement to beekeepers of all levels as together we learn and grow in our desire to care for bees as we help our local community to understand more about these busy pollinators of the environment. The Chapter is beginning its eighth year as a bee club and has grown to over a hundred honeybee enthusiasts; mostly as hobbyists who manage only a few hives. However, the club does have members who are master beekeepers with varying ranges of expertise, some of these members have over forty-years of beekeeping experience. During any typical HCBC meeting, you will find beekeepers who share a common interest in learning more about bees and their habitat, while sharing knowledge with others in the club. One of our favorite club activities is recruiting new beekeepers. You can join the hive by completing an HCBC membership form and mail it to Haywood County Bee Club, PO Box 1391, Clyde, NC 28721, along with a check for the amount indicated on the application. Better yet, print out the membership form and bring it to one of our monthly meetings! 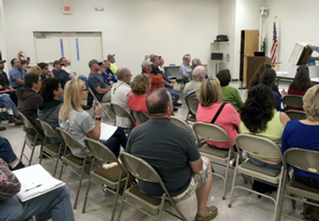 Meetings are held on the first Tuesday of each month from 7:00 p.m. to 8:30 p.m., at the Haywood County Extension Center. Guests are always welcome to come and enjoy the buzzing activity, because we care about sharing beekeeping knowledge with each other, and our community. 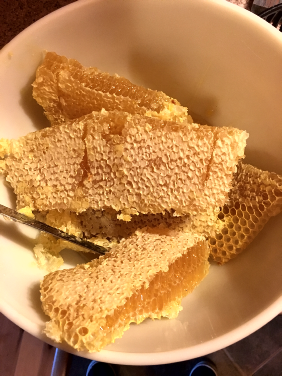 In cooperation with the Haywood County Extension Center, the club hosts two bee schools every year; a Beginning Beekeeping School and an Advanced Beekeeping School, usually beginning in January or February. 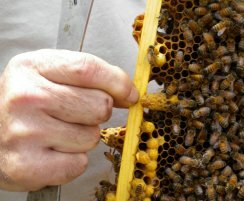 These courses can teach you everything you need to know to get started as a beekeeper. 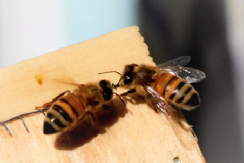 Every April, at the request of area beekeepers, a bee inspector will visit your bee apiary to address any concerns you may have. These inspections are arranged in cooperation with the Haywood County Cooperative Extension service and the North Carolina Department of Agriculture. 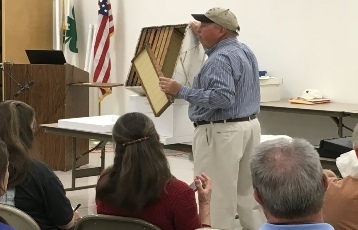 The club participates in many of the local seasonal festivals where volunteers share their knowledge of the honey bee with the use of an observation hive and educational materials. On school days, you can find our willing beekeeper volunteers at some of the local fairs displaying educational bee materials and answering questions by interested visitors. An experienced club member will gladly assist you in removing a swarm of unwelcome bees from your property, just contact us. Yeah… let’s rest awhile, then fly over and see what’s buzzing at the HCBC hive, during their next meeting or event. 2018 North Carolina State Fair in Raleigh- 1st Place- Light, Extracted Honey and “Best of Show”- Bees and Honey. 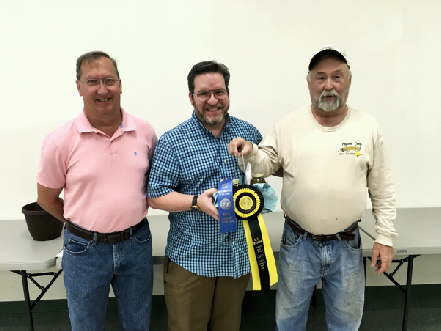 2018 Haywood County NC Agricultural Fair - 1st Place- Light, Extracted Honey and “Best of Show”- Honey. Frank is proof that one does not have to have years of beekeeping experience in order to do well in beekeeping. His efforts to do his best in apiary management have given way to these outstanding awards.